I guess that’s a question that has plagued quite a lot of us university kids who don’t like intimidation, extortion and the subsequent “grovelling” that follows. To be totally honest (as is expected of me), I’ve more than once entertained the thought of “belonging” – having that extra backing that I may just need one of these days. Aside from the fact that I’m one of the least judgmental person on earth, I actually don’t blame anybody who has taken what I would call a bold step and joined a confraternity or sorority (not as it applies to colleges in the U.S though). This is because of a myriad of reasons that may have prompted that line of action; but I am gonna keep this article to the perspective of us that actually have a choice, or should I say those of us without extenuating circumstances that drive us towards “bamming”. Having being at the receiving end of several “slapsgivings”, “obtainings”, “bruisings” and not-so-gentle-warnings, I can clearly see the usefulness of taking such an action as it preempts the many beatings and recharge card buying that the residents of Ekosodin and other “off-K” locations have come to see as a norm. It kinda gives you a feeling of security which I, with my “jewish” status of not being a member of any such confraternities, have no idea exists; and it also kinda scores with the ladies… well, some ladies. I guess the worst thing that can come out of being a “strong man” is that you might get killed… See… not that bad shey? Oh, there’s also the chance of being seriously maimed – you could be blinded, beheaded and even castrated if we’re to go by what we hear. There’s also the stigma of being known as a cultist. There’s this fear that’s always there too, even when that sound you heard was caused by a little kid stepping on an empty sachet of water, and of course, there’s the running around in the middle of the bloody night when you’re supposed to be chilling in your crib, sound asleep or at least busy with something more entertaining… if you know what I mean. As I can only speculate on that from my point of view, which I can assure you is vastly different from yours or from that of any person living for that matter, I’m gonna leave you that question to ponder on your own. Is it worth the restlessness? the apparent lack of peace? is it worth losing your humanity and compassion over? causing pains and distress in the lives of those that have done nothing to hurt you? I’ll appreciate if someone gets back to me on that question because I’m still kinda stuck on it. For me, getting killed is a major deal breaker! Even your run-of –the-mill maiming or beating so doesn’t work for me. What can I say? 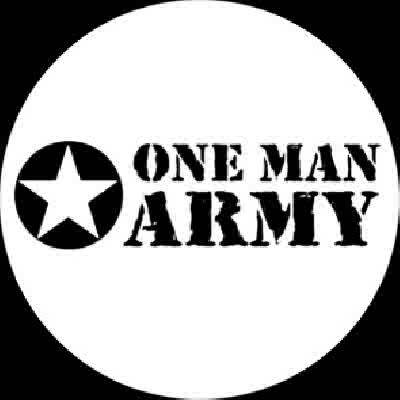 I kinda like myself the way I am: A ONE-MAN ARMY!! PS: I actually know how to speak English, I just decided to go the other way and murder it. This is brilliant dk. I do not tink its worth it to join all these confraternities and still die at the end.